US Congressmen James McGovern and Randy Hultgren. 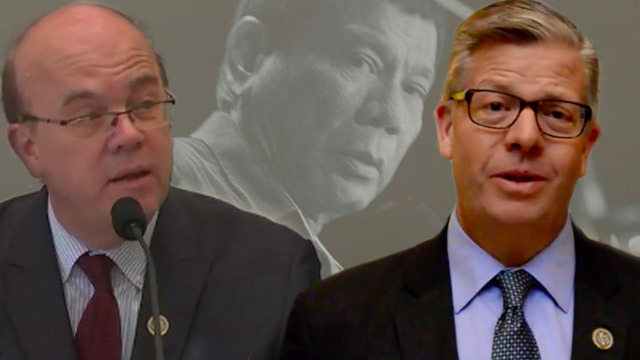 The lawmakers made the statement in response to Duterte's earlier threat to bar them from entering the Philippines after they called on US President Donald Trump to raise human rights issues during their meeting here. “We will continue to stand up for human rights and the rule of law in the Philippines and everywhere else in the world, in keeping with American and international values,” the two lawmakers said. You are not welcome here sirs. Please give us the chance to clean our society of its dregs, in our own way and in our own style. Just recently, 3 young and beautiful women were raped and murdered, one was burned beyond recognition, the boyfriend of one of them was also murdered. These victims deserve justice, a swift kind of justice. If we are going to rely on our justice system, chances are it will take a long time, maybe 50 or a hundred years before justice is served. Look at the case of the Ampatuans in the Maguindanao massacre.